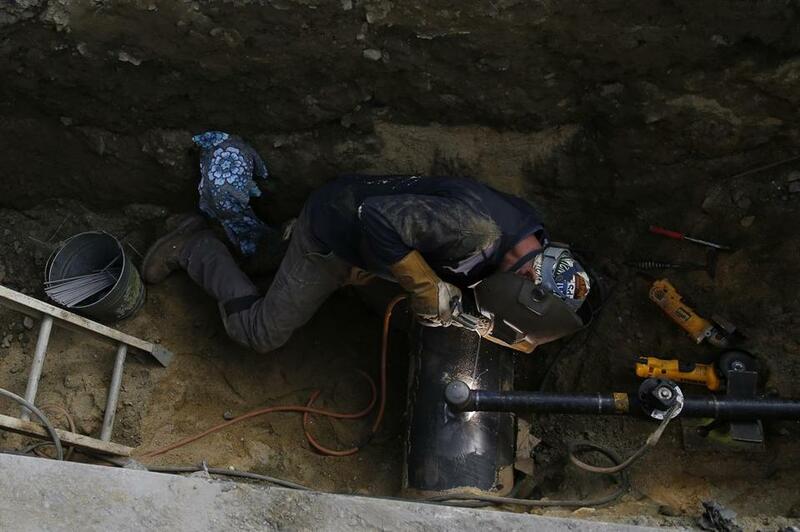 A welder installed a new pipe on Brookfield Street in Lawrence on Sept. 24 after gas explosions. Gas was shut off to 300 homes in Woburn on Monday after a rise in pressure. Less than a month after a series of explosions and gas-fueled fires devastated three towns north of Boston, a surge in natural-gas pressure Monday led officials to cut off service to about 300 homes in Woburn, prompting state regulators to impose a moratorium on almost all National Grid work. National Grid, the utility that services the pipelines, said the pressure rose when a worker “inadvertently introduced excess gas into a portion of our system” during routine maintenance work near Wyman and Hart streets. The utility said it immediately realized the mistake, which it attributed to “human error,” and reduced the pressure within minutes. National Grid officials said the pipeline system did not appear to be damaged, but that gas service was shut off “as a precaution, and to confirm that there is no damage to the system.” No one was evacuated, and officials said the homes were safe. But within hours, the state’s Department of Public Utilities announced it was ordering National Grid to halt all work across its service territory — with the exception of emergency and compliance work — until the agency’s review of the company’s safety practices has been completed. Students were taken outside the building “out of an abundance of caution,” and the building was checked and cleared. Monday’s incident was jarring news for affected residents, coming just weeks after catastrophic gas explosions set fire to dozens of homes in Lawrence, Andover, and North Andover, killing one and injuring more than 20. Thousands of homes serviced by Columbia Gas of Massachusetts remain without gas in the Lawrence area. Woburn Fire Chief Stephen Adgate said he was initially alarmed to hear about the spike in pressure. Mark McDonald, a Boston-based consultant who investigates gas explosions, said that even if no damage occurred, any issue that causes officials to cut off service to hundreds of homes should not be taken lightly. The partial shutdown quickly became an issue in the protracted labor dispute at National Grid, where thousands of union workers have been locked out of work for months. Workers called on National Grid to end the impasse, saying it is posing a serious safety risk. “Every day the experienced, locked-out workers aren’t working, National Grid is rolling the dice,” said John Buonopane, president of United Steel Workers Local 12012, which represents about a third of the locked-out gas workers. National Grid spokeswoman Christine Milligan said at the press conference that the workers involved in the overpressurization were supervisors of gas crews with experience in the field. The company said it expected to begin restoring service Tuesday, though it could be Thursday before all customers are fully restored. Milligan declined to cite the exact cause of the incident, saying the company would conduct an investigation. She stressed that the incident was unrelated to the Merrimack Valley explosions. Last week, National Grid acknowledged that customers are concerned about the safety of the system in light of the Lawrence-area explosions and the labor dispute. In September, shortly after the Merrimack Valley disaster, the state Department of Public Utilities sharply criticized National Grid for a “persistent disregard” of pipeline safety issues as it reduced the company’s request for a rate increase. “National Grid has invested considerable resources in regular inspections and maintenance, updates to our gas infrastructure, emergency planning preparation, continuous monitoring of our system, and workforce training to help ensure the safe and reliable delivery of natural gas to our 930,000 gas customers in Massachusetts,” the company posted on Facebook. Adam Vaccaro can be reached at adam.vaccaro@globe.com. Follow him on Twitter @adamtvaccaro. Dugan Arnett can be reached at dugan.arnett@globe.com. Follow him on Twitter @duganarnett.